Recently the BBC reported a rise in the number of domestic break-ins linked to ‘lock-snapping’ incidents. In the report it stated that over a quarter of all domestic break-ins in West Yorkshire are due to this method of forced entry – ie lock cylinders being snapped to gain access to the property. You can see the full report here on the BBC website. The problem lies in vulnerable Euro-cylinder locks commonly fitted to domestic doors. These locks can take just a few seconds to penetrate because their construction has a weak point, making them easy to snap. Unfortunately, however many other locking points you have including hooks, shootbolts and deadbolts, if the lock itself has been compromised these can all be disengaged; they would slow an intruder down but they wouldn’t stop them. Because of this growing problem new technology has been developed and there are now locks on the market that offer a solution using anti-snap cylinders and other preventative measures including a front section that is designed to break off leaving the cylinder intact. These locks are accredited with the TS007 3* Kitemark and/or SS312 Sold Secure Diamond standards. Many police forces, including West Yorkshire Police, recommend that all locks be upgraded to meet these standards in order to protect your property. How do you know whether your locks measure up? 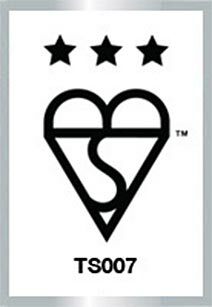 If you’re not sure whether your own locks meet these standards check to see whether they feature the British Standard Kitemark (shown here). If they don’t you might want to think about upgrading them. Remember that there are a number of measures you can take to improve your home security, 25% of burglaries don’t even involve a forced entry implying that doors may have been left unlocked or windows open. You can see our previous post here that offers some valuable tips for securing your home. If you are interested in upgrading your locks then give us a call on 01924 371941 or get in touch via the contact form. next Take a Fresh Look at our Website!